The original 1000 Mile Boot from Wolverine. This pair is handmade in the USA to reflect the quality and craftsmanship found in the original Wolverines. The Cordovan No. 8 upper, from Chicago's Horween Company, breaks in over time and ages well. The Goodyear welt construction attaches the leather sole and Vibram heel. Waxed cotton laces, 4 eyelets, and 3 lace hooks. This iconic work boot has been crafted of rugged, durable Horween leather and built with a stacked heel and classic welt construction. These marks of quality are clear indicators of the attention to detail that went into making this boot. 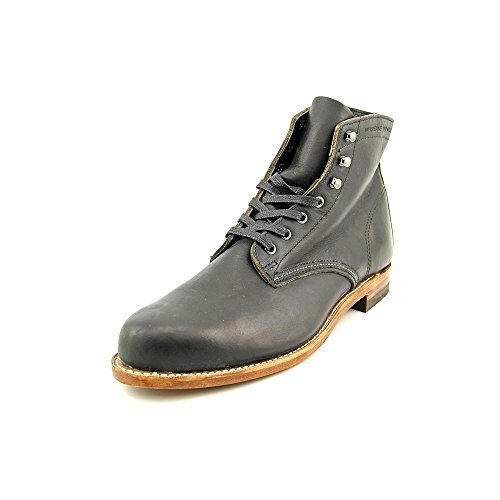 Style Name: Wolverine '1000 Mile' Plain Toe Boot (Men). Style Number: 374989. Available in stores. Store: xliquiddealsx Condition: Brand New Price: $139.99 Total Price: $139.99 Buy It from xliquiddealsx No returns. Store: Designer Handbags Shoes and More Condition: Brand New Price: $161.99 Total Price: $161.99 Buy It from Designer Handbags Shoes and More No returns. Store: Lenny's Shoe & Apparel Condition: Brand New Price: $359.00 Total Price: $359.00 Buy It from Lenny's Shoe & Apparel Want it delivered by Tuesday, April 24? Wolverine Montague 1000 Mile W08132 Chelsea Boots Brown Suede Men's Size 8.5 D.
Store: hightrends033 Condition: Brand New Price: $139.10 Total Price: $139.10 Buy It from hightrends033 No returns. Store: Secret Shoebox Condition: Brand New Price: $349.99 Total Price: $349.99 Buy It from Secret Shoebox Want it delivered by Tuesday, April 10?